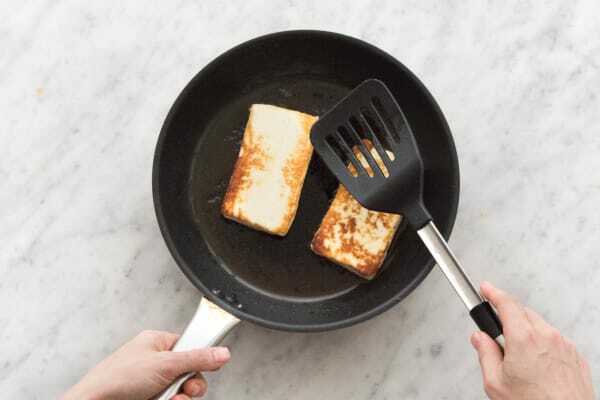 Did you ever think that you could grill cheese? We’re not talking about sandwiches but about throwing a big hunk of cheese directly onto the heat so the outsides get beautifully charred while the insides get warm and melty. It took us by surprise, but by golly, it’s tasty. 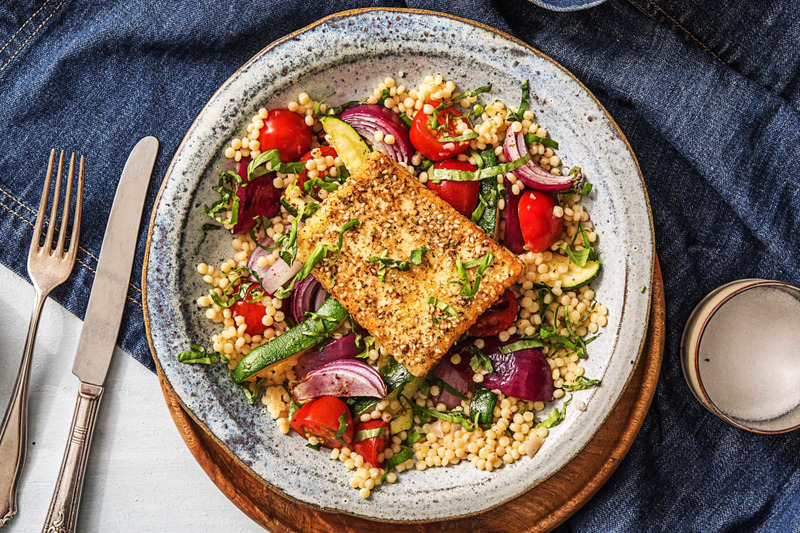 To make it, you’ll dredge the cheese in za’atar, a Middle Eastern herb blend, then serve it on top of bubbly couscous and tender zucchini and onion dusted in tangy sumac. Preheat broiler to high or oven to 500 degrees. Wash and dry all produce. 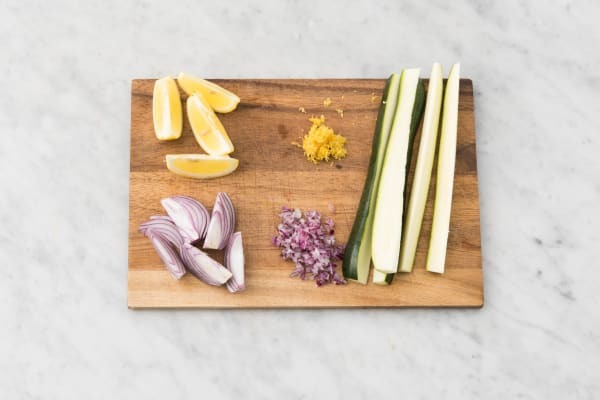 Halve zucchini lengthwise, then cut into long, thin wedges. Halve and peel onion, then cut into 1-inch-thick wedges. Finely mince 1 wedge. Zest lemon until you have 1 tsp zest, then cut into wedges. Halve tomatoes. Pick mint leaves from stems; discard stems. Thinly slice leaves. Heat a drizzle of olive oil in a small pot over medium-high heat. Add minced onion and couscous. Cook, tossing, until onion is softened and couscous is lightly toasted, 2-3 minutes. Pour in 1 cup water and stock concentrate. Bring to a boil, then lower heat, reduce to a simmer, and cover. Cook until tender, 10-12 minutes. 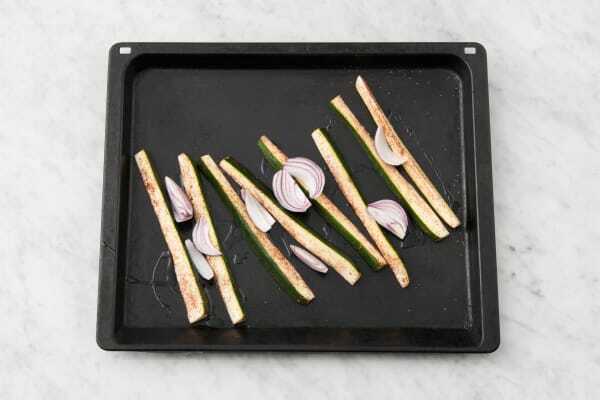 Toss zucchini and onion wedges with a large drizzle of olive oil, sumac, salt, and pepper on a baking sheet. Broil (or bake) until lightly charred, 10-15 minutes, tossing halfway through. Heat a drizzle of olive oil in a large pan over medium-high heat (use a nonstick pan if you have one). Take 4 oz grilling cheese (about half the package; we sent more than needed) and cut into two large slices. 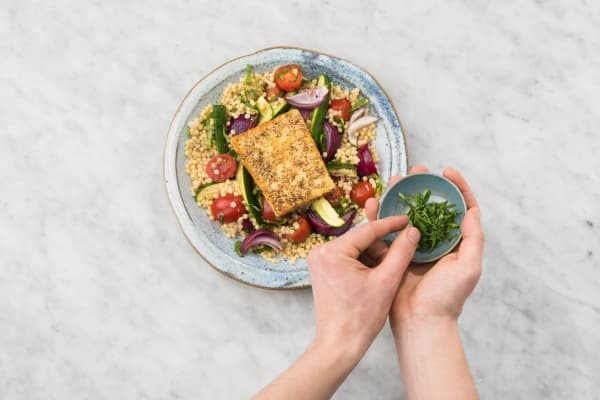 Place za’atar on a plate. 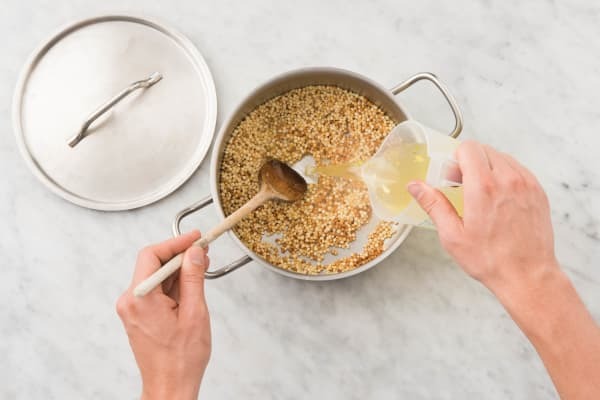 Press cheese into za’atar to evenly coat all over. Add to pan and cook until browned, 2-3 minutes per side. Transfer couscous to a large bowl once done simmering. Stir in tomatoes, lemon zest, half the mint, and a squeeze of lemon juice. Season with salt and pepper. 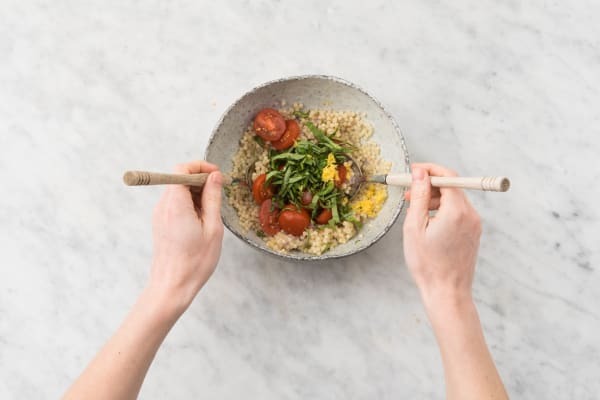 Divide couscous between plates. Top with zucchini, onion, and grilling cheese. Garnish with remaining mint and serve with remaining lemon wedges on the side for squeezing over.